Can I watch this lake chaos instead of being part of it? Weather woes. Taper tantrums. Phantom pains. 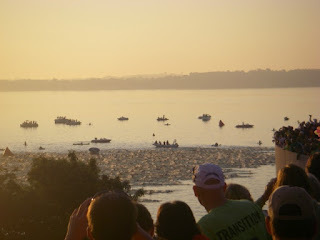 I'm too much of a worry-wart with t-minus 34 hours, give or take, until Ironman Wisconsin starts to think about writing (as has been the case for most of the week too). You'd think that with two of these already under my belt, I'd be less anxious than I actually am. But being surrounded by an abnormal amount of uber-fit athletes and bikes that make my ride look like it needs to be retired, the race day jitters start to fly. So what am I doing to calm my nerves? Definitely not looking at the weather forecast--that'll drive me crazy. Instead, I've been reading. Whoa, Lance Armstrong can't run the Bank of America Chicago Marathon? The Chicago Tribune and Runner's World explain why. If you loved the Epic Pass for its unlimited skiing at six, now seven, resorts in Colorado and Lake Tahoe, Vail Resorts just sweetened the deal on this less-than-$700-for-a-season-of-skiing pass. I know where I want to ski this winter--and it's not in the U.S. Yes! The Spartan Race is coming to Chicago in October! Who's running this 5K, or one of the others in the series, this month? I'm not even running the New York Marathon, but I'm thankful the race organizers reversed the baggage policy put into place two weeks ago. Gravity hits new heights with these yoga moves. If you missed the viral hit "The Contortionist", "The Balancing Act" is a follow up that's even more hair-raising--or motivating to get me back to regular yoga. What links are you loving today? Share them with us!